Blog Quick Quotes: Stowaway Feature with Lynn! 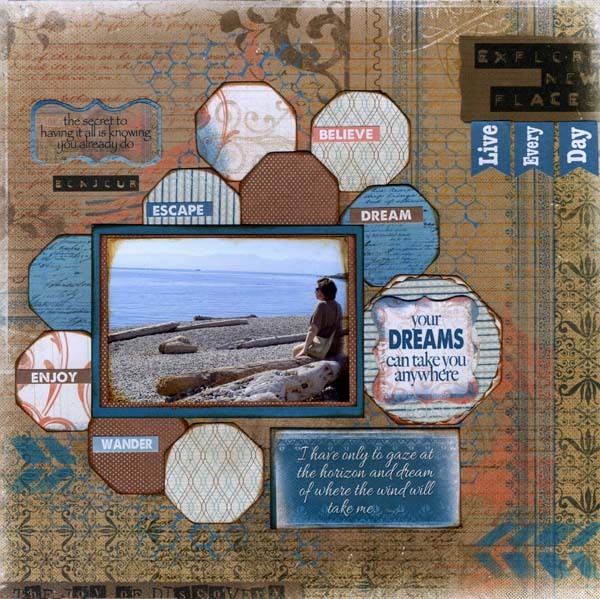 It's Lynn here today to share a layout I did using the new Stowaway Collection. This was the perfect patterned paper to scrapbook a photo of a trip my husband and I took to Vancouver Island. I love using the PowderPuff chalk inks. For this layout I grabbed a few of my stencils and the Blue Hawaiian ink and did a little background work over the patterned paper. I couldn't believe that I dabbed the ink pad once with my dabber and did the whole background!! I also used the Mocha Mama ink to distress my photo and the edges of the hexagons. I found the 6x6 Paper Pad perfect for cutting out all those little hexagons!! I hope you are all having a wonderful day and thanks for joining us at Quick Quotes! Awesome layout Lynn! I love the background work you did with the chalk ink. Great design! I love the hexagons! Gorgeous layout Lynn!! I LOVE the way you used the PowderPuff inks to add to the background! Lovin' those hexagons too! Love the stencil work and the colors! Those hexagons make such a cool design! LOVE THIS! Thanks for sharing, Lynn ! Beautiful layout, Lynn! Loving that you used the words on the hexagons. Lynn love your layout! !Love your background stamping.